Vis released their recent QR and the share price moved upwards of 10%. 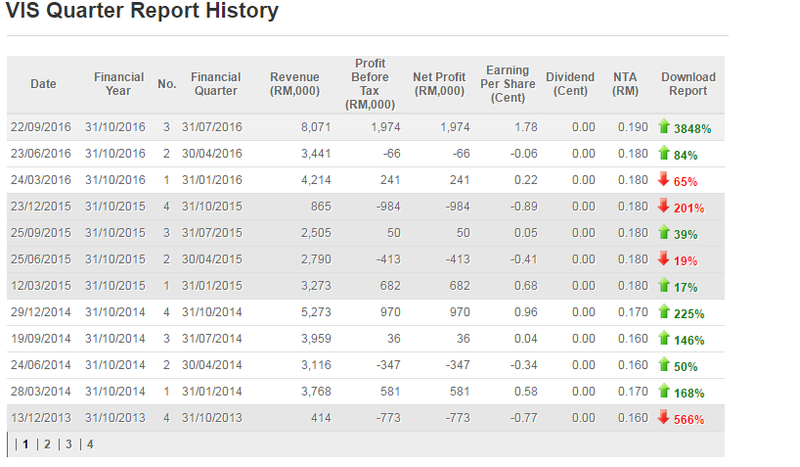 The revenue growth was amazing with a YoY increase of 222% from RM2.5 million to RM8.07 million (record high) and net profit increase of 3848% from RM1.97 million. For the immediate preceding quarter, the profit turnaround from loss of 0.06 EPS to 1.78 EPS. NTA increased to 0.19 sens. If you look at the revenue growth for the past 3 quarters, you can see the significant increase in volume and most importantly, it has reached a level that delivered significant impact to the bottomline of the company. I am happy with the growth but more importantly, the ability of the management to translate growth into actual earnings unlike the earlier quarters. From the chart below, Vis earnings has been volatile and inconsistent. Being in the semicon industry, the company is exposed to the cycles of the business. Cost in itself is a key metric in determining the margin. This year thus far, the management appear to have been able to achieve record margin of 13.7% for the 3 quarters of the years. This is a very good performance, unlike before. I dug deeper into the earlier preceding quarter where there was a huge jump in revenue yet the company made losses. So it was explained that the cause would be the unrealised forex loss and higher travelling expenses and sales and services commission. Both of these instances were clearly less apparent in the latest quarter as the currency stablised (slight strengthen) against MYR and the management appear to be able to control the cost better. Considering the tough market, it is quite surprising to see the management rather confident with the future prospect. This is another plus point. Additionally, in the commentary by the management regarding the prospect of the company from the immediate preceding quarter, the management managed to keep up with their assurance on delivering better results due to their new product model and growth in customer base. This clearly reflected their ability to deliver. Previously, I mentioned that I like the fact the sales revenue improved significantly. 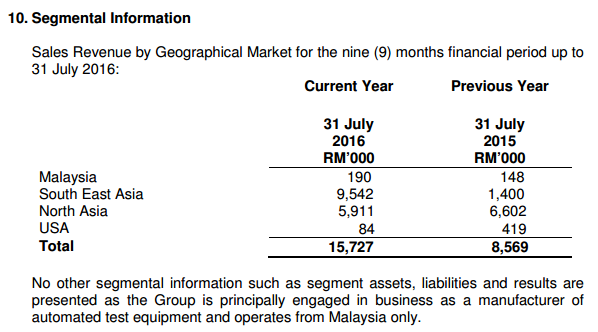 From the report, we can see the revenue were derived from various geographical locations outside of Malaysia with strong presence in South East Asia and North Asia. The exposure to US also have fallen with primary focus on Asia region. This is beneficial in the long run as the business is considered to be protected from the slowing local domestic sentiment. I believe Visdynamics is currently undervalued at 12x trailing PE for a penny counter. Forward looking, assuming the management is able to maintain their profit margin and revenue whilst improving their cost control, the company should be able to deliver a positive EPS. I am not looking for similarly strong performance but rather acheiving just 0.5 sens EPS, bringing it to a full year EPS of 24.4 sens. Applying a multiple of 12x, the fair value would be RM0.29 sens. This is excluding their potential future growth which will lift the PE valuation provided the company can manage their results consistently but I will revisit in the coming quarterly results. At time of writing, the share price is trading at 22.5 sens, it is my take to collect Visdynamics and hold until the next quarter to get a full year picture.